Father Myles Smith, a retired diocesan priest, died on May 2 at IU Health-Bloomington Hospital. He was 67. The Mass of Christian Burial was celebrated at 11 a.m. at St. John the Apostle Church in Bloomington. Burial followed at the Priests’ Circle at Calvary Cemetery in Indianapolis. Bishop Christopher J. Coyne, apostolic administrator, was the principal celebrant. Father Joseph Moriarty was the homilist. Myles H. Smith was born on Nov. 6, 1944, to Delmore and Kathleen (Behrmann) Smith, and grew up in Immaculate Heart of Mary and St. Thomas Aquinas parishes, both in Indianapolis. He attended the grade schools of both parishes and received priestly formation at the former Latin School in Indianapolis, the former Saint Meinrad College in St. Meinrad and the Catholic University of Louvain in Louvain, Belgium. Archbishop George J. Biskup ordained Father Smith to the priesthood on July 25, 1970, at Immaculate Heart of Mary Parish in Indianapolis. 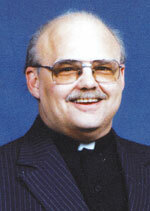 Father Smith’s first pastoral assignment was as assistant pastor of St. Michael the Archangel Parish in Indianapolis. In 1972, he was appointed assistant pastor of Our Lady of Perpetual Help Parish in New Albany. The following year, he became the assistant pastor of St. Therese of the Infant Jesus (Little Flower) Parish in Indianapolis. In 1974, he was granted permission to pursue graduate studies in canon law at the Catholic University of America in Washington. Father Smith was appointed a notary in the archdiocesan Metropolitan Tribunal in 1976. In 1977, he was appointed chaplain of the Catholic Student Center at Indiana University-Purdue University Indianapolis while continuing as a notary. In 1980, Father Smith was assigned as associate pastor of St. Pius X Parish in Indianapolis. He was appointed pastor of St. John the Apostle Parish in Bloomington in 1982, a post he held until 1995. In addition to his duties at St. John, Father Smith was also appointed in 1993 to serve as the deputy defender of the bond in the Metropolitan Tribunal. In 1998, Father Smith was again appointed as deputy defender of the bond. In 2007, he was granted early retirement.